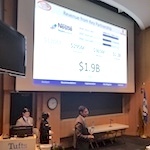 TUNECC is a life sciences consultancy competition where students and researchers are given an actual business case scenario: the company Seres Therapeutics specializes in microbiome therapies and is running out of cash but possesses great assets in their research pipeline that could make a profit. The students were tasked with developing a strategic plan to ensure the company’s short-term and long-term survival. helped the team prepare for the contest. The team included Munish Chhabra, a biophysics Ph.D. student in the lab of biochemistry professor Tom Record; Alex Harwig, a postdoctoral scholar in the lab of biochemistry professor Bob Landick; Jennifer Yao, a Biophysics Ph.D. student in the lab of chemistry professor Sam Gellman; and Jonathan Valdez, a master’s student in the Department of Food Science. The teams had two weeks to put together their plan and presentation. The members of Badger Business Solutions put in many hours outside their regular lab work to analyze the materials provided about Seres Therapeutics and come up with solutions as a team. Their presentation consisted of a three-pronged approach. Badger Business Solutions logo team created. Members of the team learned how to analyze and make recommendations based on quarterly reports and financial and scientific documents. They also learned how to work on teams and about what careers exist outside of academia. As members of WiSolve, the team’s members are either planning to pursue a career in life sciences consulting or exploring the possibility. Harwig says the opportunity was great for broadening his horizons about possibilities outside of academia. Chhabra adds that even for students interested in academia, the experience allows them to think about their lab work and scientific papers differently. Round one of the competition consisted of a 15-minute presentation and 15-minute question and answer session with industry judges. Five finalists were then selected for a public presentation. The team placed third among a competitive group of universities from the Northeast, such as Harvard and MIT.